Information in the x-strap.com website and in related forms, brochures, etc., is intended to assist potential customers in making purchase decisions when selecting out products without medical advice. To that end, the website and related publications only contain general information about products offered for sale X-Strap Systems. Under no circumstances should this information be interpreted as medical diagnosis, opinion or advice, which must only be provided by licensed medical providers. A doctor's opinion should be sought prior to using any orthopedic device. Additional user information is provided in the Comfort and Care section of each of our products. Although there are many causes, FOOT DROP is usually caused by nerve damage. It may also be caused by muscle damage, abnormal anatomy, or by a combination of these, thereby producing an abnormal, exaggerated walking gait. Foot drop is characterized by toe dragging and by steppage gait, where the foot slaps down onto the floor when walking. To overcome the dropped foot, the patient may use a characteristic tiptoe walk on the opposite leg, or may raise the knee and thigh excessively, as if walking upstairs, thereby raising the foot high enough to prevent the toe from dragging. This movement may cause the foot slapping sound often associated with a dropped foot. A wide outward leg swing may also be employed to facilitate ambulation. PLANTAR FASCIITIS is a painful inflammation of the plantar fascia, a fibrous band of connective tissue originating on the bottom surface of the calcaneus (heel bone) and extending along the sole of the foot towards the five toes. It has been reported that plantar fasciitis occurs in two million Americans a year, and 10% of the population over a lifetime. Plantar fasciitis is commonly associated with long periods of weight bearing and overuse. Among non-athletic populations, it is associated with a high body mass. The pain is usually felt on the underside of the heel and is often most intense with the first steps of the day. The sufferer may also have difficulty bending the foot so that the toes are brought toward the shin (decreased dorsiflexion of the ankle). Plantar fasciitis is also associated with increased probability of knee pains, especially among runners. ACHILLES TENDONITIS, distinguished by inflammation of the Achilles tendon, often resulting from sport-related or other vigorous activities involving overuse, intense exercise, jumping, or other movements that strain the tendon and calf muscles. In most cases, the pain associated with Achilles tendonitis develops gradually, and affects just one foot, although it can occur in both feet simultaneously. Achilles tendonitis is worst with the first few steps after awakening, although it also can be triggered by long periods of standing, or by getting up from a seated position. Achilles tendonitis causes a sharp pain in the heel. Repetitive stretching and tearing can cause the fascia to become irritated or inflamed. Ignoring Achilles tendonitis may result in a chronic condition that can hinder one?s regular activities, and that may also lead to developing foot, knee, hip or back problems because of the way one?s gait is affected. Factors that may increase the risk of developing Achilles tendonitis include one or more of the following: age, gender, certain types of exercise, faulty foot mechanics, obesity, occupations that keep one on one?s feet, improper footwear. The HEEL SPUR (or calcaneal spur) is a nail-like growth of calcium affecting the ligaments and tendons of the foot, where they attach to the heel bone. A heel spur can only be positively confirmed using X-ray radiology. It results from an anatomical change of the heel bone (calcaneus), where the spur grows from the bone into the flesh of the foot. When it is located on the bottom aspect of the heel bone, it is often associated with plantar fasciitis. Although it may take years to become a problem, once it appears, it may cause considerable suffering, since the spur can be a source of continuous pain. The pain can be sufficient to immobilize one. The calcaneal spur is seen most often in persons over the age of 40, and can also be associated with osteoarthritis, rheumatoid arthritis, poor circulation of the blood, and other degenerative diseases. Men and women are equally likely to have heel spurs. The pain is most severe when one starts to walk after a rest. If excessive strain has been placed on the foot the previous day, the pain may increase. A sudden strain produced by leaping or jumping can also increase the pain. The pain may be localized at first, but continued activity can cause the entire heel to become tender and painful. SHIN SPLINTS is a general medical term denoting medial tibial stress syndrome, a slow-healing, painful condition in the shins, caused by activities such as running, jumping, dancing or sprinting. The function of the muscles of the shin (tibialis anterior) is to dorsiflex the foot (bend the foot upwards at the ankle. It might not be immediately obvious why a muscle which raises the toe can be stressed (injured) by running, because propulsion is not its function. Overstride is the reason: the stress derives from the runner landing heavily on the heel with each foot strike, thereby slapping the ground with the full sole of the foot. This forceful extension (plantar flexion) of the foot causes a corresponding rapid stretching of the attached muscles. The muscles reflex with a powerful contraction that leads to soreness and possible injury of the muscle, tendon, and connective tissue. A possible contributing cause of shin muscle pain is weakness of the muscles of the shin, compared to the relative strength of the calf muscles, at the back of the leg. The shin pain is attributed to a forced extension of the muscle, by the opposing calf muscles. Short-term or long-term ARM AND SHOULDER SUPPORT is routinely prescribed following rotator cuff repair, elbow repair, fractures, sprain and strains, and for chronic arm weakness. When the ligaments in the foot/ankle are stretched beyond their normal limits, ankle injuries result. Two types of ankle injuries, known as INVERSION and EVERSION sprains, affect ankle joints that are stretched excessively to the sides. INVERSION sprains occur in more than 95% of the cases, typified by the foot rolling over so that the sole of the foot faces the other foot. EVERSION sprains rarely occur. When eversion sprains occur, the foot rolls outwards, with the sole of the foot facing away from the other foot. Ankle sprains are the most common sports injuries, and can also happen during everyday activities. An unnatural twisting motion of the ankle joint can happen when the foot is planted awkwardly, when the ground is uneven, or when an unusual amount of force is applied to the joint. Sprained ankles are the most frequent type of musculoskeletal injury seen by primary-care providers. 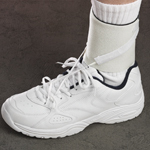 More than 23,000 people each day in the United States require medical care for ankle sprains. For most people, an ankle sprain may only occur once in a lifetime, and may heal within a few days with proper rest, treatment with ice, and elevation of the limb. For many people, however, ankle sprains occur repeatedly, quickly becoming chronic. 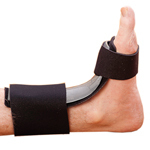 Many people that suffer chronic ankle sprains experience them bi-laterally. For these individuals, preventive steps are necessary in order to avoid repeated injury. 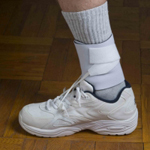 The best way to prevent ankle sprains is to support the ankle joint by using some form of bracing, which historically includes the use of ankle taping, or, alternatively, by applying some type of ankle brace. Ankle taping cannot be applied properly by the user, and requires the skills of a certified athletic trainer. 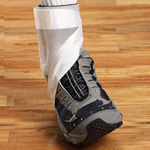 Tape also is limited in that it only remains fully effective for a few minutes of sports activity. Taping on a regular basis is also time consuming, and expensive. The preferred method for achieving consistent ankle joint stability when a trainer’s help is not available is to use some form of brace. The problem with most braces is that the more supportive the brace is, the less comfortable it feels, and the more it restricts normal ankle joint range of motion. The ideal ankle brace must be fully and consistently supportive, must permit full ankle joint mobility, and must remain comfortable at all times. This is not easily accomplished, and most ankle braces do not achieve all these objectives. CLICK ON A HEART BELOW TO DISPLAY A SPECIFIC PRODUCT.